10:00 – In the morning in the hotel lobby You will guide and tour to Yokohama! Symbol of the city – a skyscraper Landmark Tower – the tallest building in the country height of almost 300 meters. Up to the top floor of the building can be reached in just 40 seconds with ultra-fast elevator, inscribed in the Guinness Book of Records. With a height of 112.5 meters Ferris wheel offers an amazing view of the city and even seen the bridge over the Yokohama Bay . This bridge – the pride of Japan. Built in 1989, openwork suspension bridge is a huge ultramodern building length of 860 meters. You will visit the island Hakkeydzima entertainment. 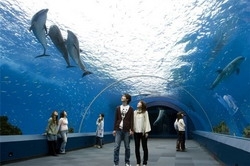 Visiting Hakkeydzima skeleton, you can spend time helpful and very pleasant, because here is one of the most famous in Japan and the world Aqua museum with a unique underwater escalator and a great water park and amusement park. Start still stands with the museum, which is a giant aquarium. Walls, ceilings and floors here are made of thick glass, so you will find yourself at the bottom like OCEAN. You will see 70,000 variety of fish and other inhabitants of the deep. The Oceanarium completely lost touch with reality. On the escalator you drive through the tunnel in the aquarium among shoals of fish, rays and sharks. 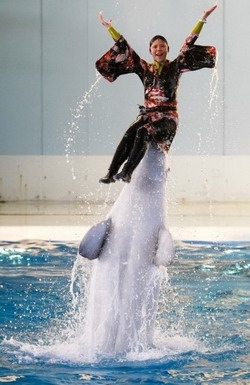 It is worth noting Dolphinarium: these cute sea friends are always ready to talk. Here and there, there are open little shallow aquariums in which sea urchins, stars, and even some shellfish serpentine fish can be touched. One of the worst parts of the museum – aquarium with sharks .At the top is arranged a pond where you can feed the ducks. Obligatory point of the program is a visit Akvastadiona and sea show on the water, with the participation of dolphins, whales, sea lions and seals. The second half of the allotted time you will spend in a wonderful water park with many water slides and attractions. And the most daring can tickle nerves to the “Blue Waterfall”, a tower height of 107 meters, from which you fall at breakneck speed. 13:00 – For lunch, you can in one of the island restaurants for a refined table with sea views of the ocean or the Yokohama Bay. Guides will help with a choice of dishes. 14:00 -. 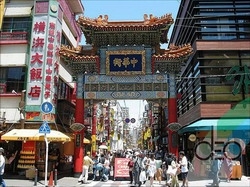 Continuation of the tour you will visit Chinatown in Yokohama – one of the largest not only in Japan but also in Asia in general. 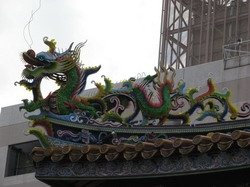 Chinatown is one of the main attractions of the city, which is visited by tourists from around the world. Interestingly, with the four cardinal quarter crowned the beautiful gates, each painted in a different color. Here you will find a great variety of shops, which invite barkers, restaurants and cafes, which serves traditional Chinese dishes. Visit Chinatown leave you with colorful, unforgettable experience. You will visit the center of the fashion city of Yokohama – Motomachi district , where is the many boutiques of famous brands. In February and September are carried out grandiose sales. A wide network of stores located at the station in Yokohama . More than 500 stores located in the shopping alley Isedzaki. Shoppers will not fail to look at the Queen’s Square , as well as in the shopping center of the Plaza the Landmark .